TOKYO: The strongest typhoon to hit Japan in 25 years battered the west of the country yesterday with violent winds and heavy rain, killing six and injuring scores more. Powerful gusts ripped sheeting from rooftops, overturned trucks on bridges and swept a tanker anchored in Osaka Bay into a bridge to Kansai International Airport. The damage to the bridge left the airport cut off from the mainland and stranded around 3,000 people there, an official said. The airport was now conducting safety tests on the undamaged section of the bridge, the official said, but it remained unclear when the passengers could leave. High waves whipped up by the storm also flooded parts of the airport, where all flights were cancelled, and the severe weather caused power outages and travel chaos across much of the country. Typhoon Jebi made landfall around noon, slamming into the west of the country with winds of up to 216 kilometers per hour. The fast-moving storm quickly crossed the mainland, and by nightfall was heading out to sea from Ishikawa in central Japan. Public broadcaster NHK reported at least six deaths in the storm, including a 71-year-old man killed in western Shiga prefecture after being trapped under a warehouse that collapsed in strong wind. NHK said 164 people had suffered mostly minor injuries. In Osaka television footage showed the large tanker smashing into the bridge connecting the city of Izumisano with Kansai airport, with its superstructure battering away part of the bridge. Local TV also showed footage of a 100-metre tall ferris wheel in Osaka spinning furiously in the strong wind despite being switched off. “I’ve never seen such a thing,” a 19-year-old boy at the scene told NHK. Elsewhere, the winds whipped away part of the ceiling from Kyoto station and peeled off multi-storey scaffolding on a building in Osaka. The storm left more than one million households without power and evacuation advisories were issued at one point for nearly 1.2 million people, with another 16,000 under stronger — though still not mandatory — evacuation orders. 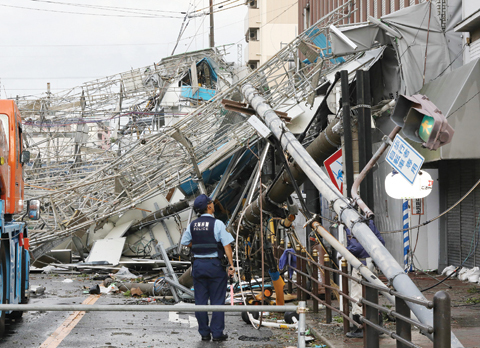 Prime Minister Shinzo Abe had urged people to evacuate early and ordered his government to take all necessary measures to protect residents, after the weather agency warned of landslides, flooding and violent winds, as well as high tides, lightning and tornadoes. Local media warned that the wind was strong enough to topple traditional-style wooden houses as well as power poles, and urged people in affected areas to avoid non-essential travel. Primary and middle schools in the storm’s path were closed while regional businesses including Universal Studios Japan in Osaka and factories for several large manufacturers shut down. Nearly 800 flights were cancelled, including several international flights departing and arriving at Nagoya and Osaka, along with ferries, local train services and some bullet train lines. Jebi had a similar trajectory to Typhoon Cimaron which made landfall on August 23, disrupting transport but causing limited damage and few injuries. Japan is regularly struck by major storms during the summer and autumn. The country has been sweating through a record deadly heatwave that followed devastating rain in parts of central and western Japan that killed over 200 people.